Glass, being a 100% environmentally friendly and recyclable material, is the ideal choice for green housing projects. In this field, one of the most important factors is thermal insulation: windows must be made in such a way as to prevent heat dispersion during winter and limit its penetration in summer. The most common choice is “double glazing”, which is a structure formed by double glasses with a gap in the middle. Both for normal architectural constructions and for those belonging to the “green” category, Veneto Vetro offers a wide range of selective and low-emission glasses. Selective glasses limit the heat entering the building without compromising the amount of light, while low-emission ones prevent the heat from dispersing to the outside. 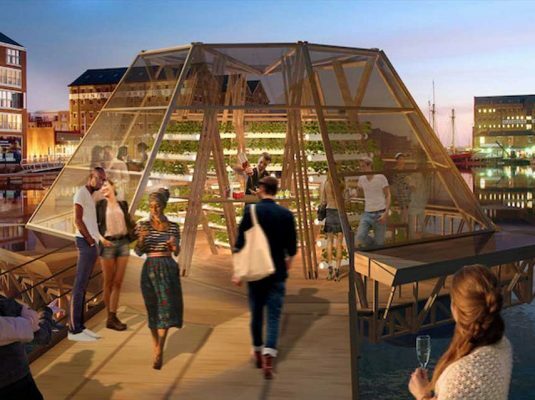 Veneto Vetro took part in the Studio Mobile project, the Jellyfish Barge, an environmentally friendly greenhouse that will be used as a floating vegetable garden in the future.